In 2015, Intel and Micron unveiled 3D XPoint memory, a new competitor to flash memory that promised significantly higher performance and endurance. Several years later, Intel has successfully commercialized 3D XPoint memory in a growing range of Optane products, but other alternative non-volatile memory technologies are still largely stuck in the lab. To compete against Intel's Optane SSDs, Samsung decided to exercise their lead in 3D NAND flash memory to produce a specialized high-performance variant, which they call Z-NAND. Fittingly, the first SSDs they use it in are branded "Z-SSDs". The first two models to be released were the SZ983 and SZ985, which were both high-end drives specifically for datacenter customers. Meanwhile, with their major datacenter customers taken care of, Samsung is moving to make more of their enterprise and datacenter storage products available through retail distribution channels instead of just large-volume B2B sales. Spearheading that initiative, the SZ983 is now being sold to retail customers as the Samsung 983 ZET. Samsung originally announced Z-NAND in 2016, a year after 3D XPoint memory was announced and before any Optane products had shipped. Fundamentally, the first generation of Z-NAND is an effort to turn back the clock a bit; to step back from today's modern, high-density, (relatively) high-latency Triple Level Cell (TLC) NAND and back to simpler Single Level Cell (SLC) designs. SLC designs are relatively straightforward: since they only need to store a single bit of data per cell, the cell only needs to be in one of two voltage states. And this makes them both faster to read and faster to write – sometimes immensely so. The tradeoff is that they offer less density per cell – one-half or one-third as much data as the equivalent MLC or TLC NAND – and therefore a higher cost per bit overall. This has lead to the rapid adoption of MLC and then TLC, which for most use cases is plenty sufficient in terms of performance while also offering great capacity. However there are markets and use cases where absolute speed (and not capacity) is king, and this is where a SLC-based storage solution can provide much better real-world performance; enough so to justify the higher per-bit cost. And it's this market that Intel and Samsung have been exploiting with their 3D XPoint and Z-NAND products respectively. Adding an extra wrinkle to all of this is that Samsung's Z-NAND isn't merely SLC NAND; if simply operating existing NAND as SLC was all there is to Z-NAND, then we would also expect Toshiba, WD, SK Hynix to have also delivered their competitors by now. Instead, Samsung has taken additional steps to further improve their SLC-based Z-NAND. We'll go into greater detail on this on the next page, but one of the big changes here was lowering the read and program times of the NAND, which further improves its read/write performance. This is important for Samsung both to give them an edge over the aforementioned competition, but also to ensure Z-NAND is competitive with 3D XPoint, which has proven to be no slouch in this area. On paper then, Samsung's Z-NAND looks plenty fast for the kinds of workloads and markets Samsung is chasing. Now it comes to Samsung's 983 ZET to deliver on those ambitions. 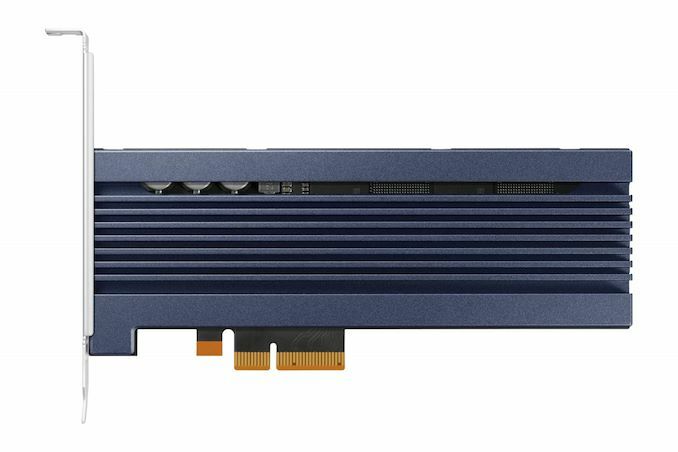 The Samsung 983 ZET uses the same Phoenix controller that we are familiar with from their TLC-based 983 DCT and the 970 family of consumer NVMe SSDs. Eight channels makes for a high-end controller in the consumer market, but this is more of an entry-level controller in the datacenter space—the other flash-based SSDs we're comparing against have more powerful 12 or 16 channel controllers. The 983 ZET is available in just two capacities, both using a PCIe add-in card form factor. Samsung has demonstrated a M.2 Z-SSD and this controller is used in several other M.2 and U.2 drives, but the Z-SSDs are a relatively low-volume product and this retail channel version is even more of a niche product, so the limited range of SKUs makes sense. The sequential read and write specs for the 983 ZET are typical for high-end NVMe drives with PCIe 3 x4 interfaces, but it's uncommon to see these speeds at such low capacities: the small per-die capacity of Samsung's Z-NAND gives the 480GB 983 DCT as much parallelism to work with as a 2TB TLC drive. The random read performance of 750k IOPS is impressive for a SSD of any capacity, and while it isn't entirely unprecedented, it is significantly higher than the 550k IOPS that Intel's Optane SSD DC P4800X is rated for. The random write specs bring the first difference in performance between the two capacities of the 983 ZET, and a stark reminder that we're still dealing with some of the limitations of flash memory. The steady-state random write performance is just 60k to 75k IOPS, an order of magnitude lower than the random read performance. Intel's Optane SSDs are only slightly slower for random writes than random reads, so the 983 ZET won't be able to come close to matching Optane performance on workloads that include a significant quantity of random writes. Write endurance for the 983 ZET also falls short of the bar set by Intel's Optane SSDs, with 8.5 DWPD for the 480GB 983 ZET and 10 DWPD for the 960 GB model, while the Optane SSD debuted with a 30 DWPD rating that has since been increased to 60 DWPD. This review builds on our recent roundup of enterprise SSDs, and follows the same format and test procedures. This review is strictly focused on the use of the 983 ZET as a datacenter SSD, but we will have a follow-up to assess its suitability as an enthusiast class workstation/consumer drive. Our collection of enterprise and datacenter SSDs is much smaller than our almost comprehensive catalog of consumer SSDs, but we do have drives from several different market segments to compare against. Most of these drives were described in detail in our last enterprise SSD review. The most important competitor is obviously the Intel Optane SSD DC P4800X, Intel's flagship and the drive that Samsung's Z-SSDs were created to compete against. The Micron 9100 MAX 2.4TB, based on 16nm MLC with excessive overprovisioning: a 4TB raw capacity but only 2.4TB usable. The Memblaze PBlaze5 C900 and D900, both based on Micron 32L TLC NAND. We have a 6.4TB sample of the newer generation PBlaze5 with 64L TLC on the way for a future review.
" What spaghetti code has to do with that I have no idea. " "They have at least encouraged old-school databases to up their game. " well... if you actually look at how these 'alternatives' (NoSql and such) to RDBMS work, you'll see that they're just re-hashes (he he) of simple flat files and IMS. anything xml-ish is just another hierarchical datastore, i.e. IMS. which predates RDBMS (Oracle was the first commercial implementation) by more than a decade. hierarchy and flatfile are the very, very old-school datastores. PG, while loved because it's Open Source, is buggy as hell. been there, endured that. Okay, no, just no. Pursuing normalisation beyond 3rd normal form is lunacy. You actually start losing ground on compression at that point, and your queries get ridiculously more verbose. 4th & 5th normal form are touted by academics who never have to work with them and DBAs who have more time on their hands than sense.